When Rollie Younger exhibits his teapots, men take notice. 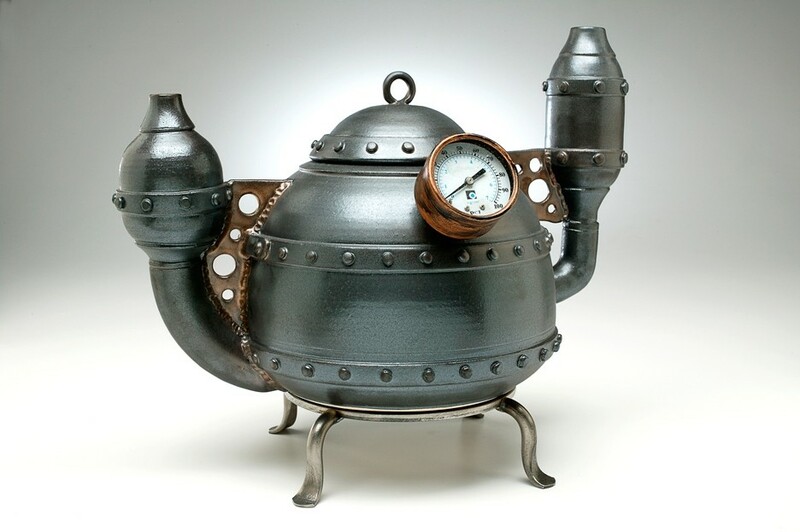 Younger has even overheard one (female) passerby scoff to another that the teapots are “a guy thing.” This perception may have something to do with the rivets, or the pressure gauges, or even the blue-collar industrial aesthetic that characterizes his boiler teapot series. In all, he has completed about a dozen. Some recline on arched metal legs, angry metallic crabs with pressure gauges protruding in various directions and angles, some jauntily astray like a flower in a girl’s hair and others inquisitively peeping from the teapot’s peak. Some of the spouts, too, are friendly, with others engorged like bellows. Many have bridges linking the body and spout, like scraps of delicate metallic lace. 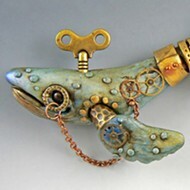 Younger created his first piece, Turbo Tea, in 2003 while taking a ceramics class at Cuesta College. Despite having taught the subject at a Pasadena High School for 30 years, the artist relished the opportunity to once again be a student. The title was inspired by a fellow student, a former Cal Poly professor, who took one glance at the teapot and told him it was turbo charged. Younger exhibited that first teapot in Santa Barbara, and began making more. He also began experimenting with rivets. After the rivets came the pressure gauges, supplied by the owner of a pump rebuilding company who presented Younger with a box of old gauges. These barometers don’t actually work, but the teapots themselves are functional, a notion that horrifies the collectors who provide them a home. Currently, the majority of the boiler teapots are scattered to the four winds, in private collections around the country, and Younger has yet to assemble more than three of them in a single location. Which will make the assembly of seven teapots at the SLO Art Center between Jan. 23 and March 1 an event of note. 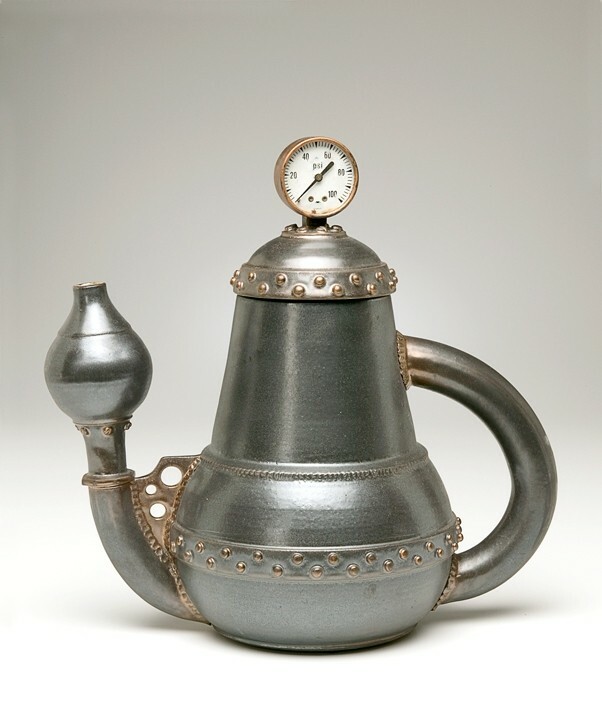 The exhibit, Rollie Younger: Tea Time for Retro-Industrialists, includes several teapots borrowed from local collections. 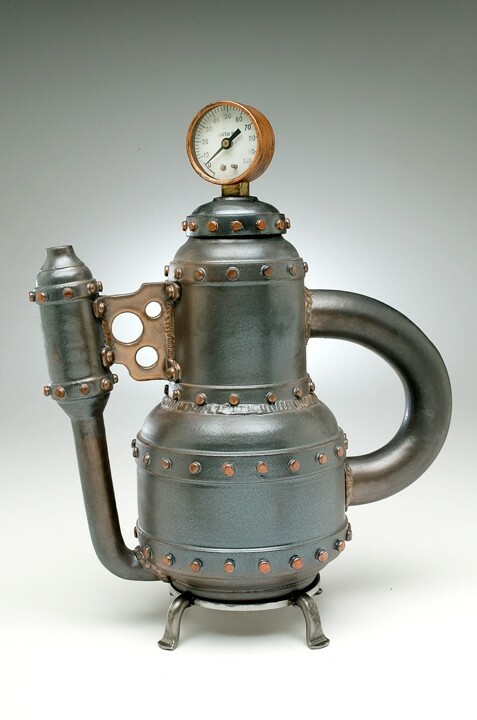 One of his vessels, High Pressure Tea, is part of the world’s largest teapot collection. Teapots are an admittedly unusual muse, and particularly so given the fact that Younger generally creates functional ware, including bowls, wave plates, and more traditional teapots. And the highly creative boiler teapots appear only very distantly related to their more standard counterparts; one might anticipate a merry, shrill whistle from the latter, but the former looks as though it would produce a sound far more functional, like the intrusive blare of a foghorn. Traveling, particularly to such destinations as Japan, Denmark, and England, developed his appreciation for the culture and belief system surrounding tea; each country’s potters have their own theories about how the spout should be made to minimize drip. Younger often finds himself making multiple spouts for a single project, and then embracing one over the others. Culling various teapot appendages from what he calls his “parts bucket,” Younger rarely finds himself creating a fresh piece from start to finish. Instead his process, not unlike Frankenstein’s, entails patching together pieces that he previously created. As a finishing touch he sprays a black bronze glaze onto the piece, creating the trompe l’oeil impression that the entire teapot is comprised of iron. For Younger, details like the spray and rivets are a subliminal trail he lures the viewer along, hopefully concluding in the mistaken belief that the piece is, in fact, metal. Inspiration sometimes comes knocking while Younger is working in his Cambria studio. Sometimes, he hurries it along by sketching the contents of his imagination. He’s currently considering creating horizontal boiler teapots, which he has not yet attempted. Sometimes, a teapot goes astray during the creative process, resulting in banishment of the failed piece. 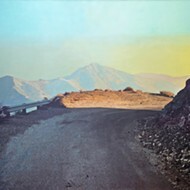 ROLL ON BY: Rollie Younger: Tea Time for Retro-Industrialists runs at the SLO Art Center Jan. 23 through March 1. The Art Center is located at 1010 Broad Street. For more information visit sloartcenter.org or call 543-8562. “For whatever reason I don’t like them. And if I don’t like them I don’t let them out,” said Younger, gesturing towards a tree stump where two teapots were relegated after they failed to conform to his expectations. But a greater number of his pieces wind up in private collections. Arts Editor Ashley Schwellenbach is tea-riffic. Berate her terrible pun at aschwellenbach@newtimesslo.com.